A long time had passed since my last true outdoor challenge. But unexpectedly, I got a reminder of the power of wilderness, the magic in facing frightening challenges, and the glow and growth of walking through to the other side of the experience. 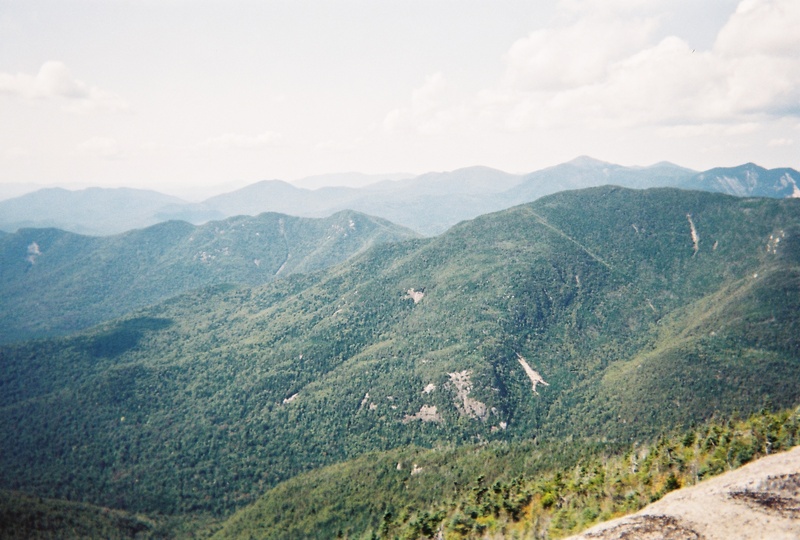 That’s what Dix Mountain became for me this summer—surpassing even the knee injury on Algonquin Peak. I had long avoided climbing Dix Mountain. I’ve seen it several times, sitting across the highway from Giant Mountain. But I’d heard it was a two day hike, involving camping on the mountain, while I was focusing on day trips. I also wasn’t anxious to cross the rock slide visible from the ground. It didn’t seem like an enjoyable time necessarily. 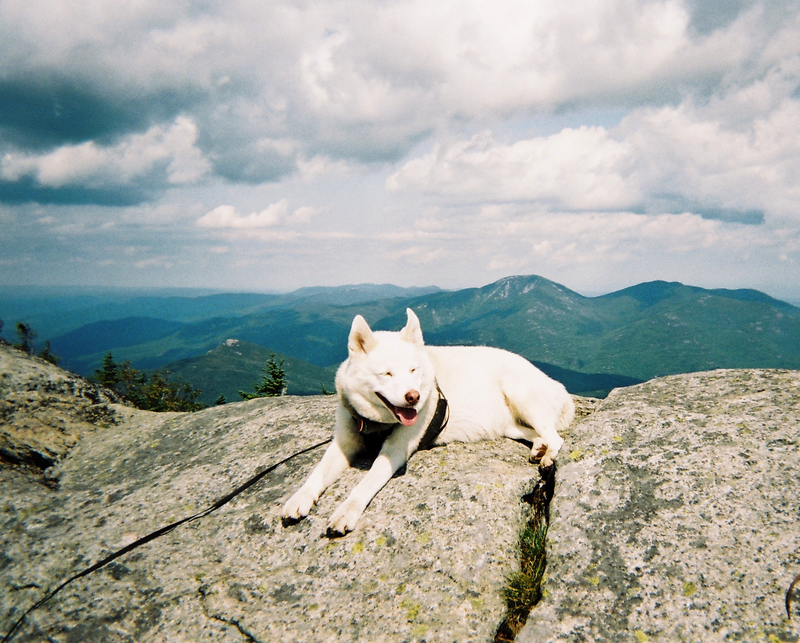 I had climbed all three mountains in the Presidentials of New Hampshire’s White Mountains, and while I’m glad of it, they were long walks for hours up rocks. But that changed the day I climbed Mt. Marcy this summer. 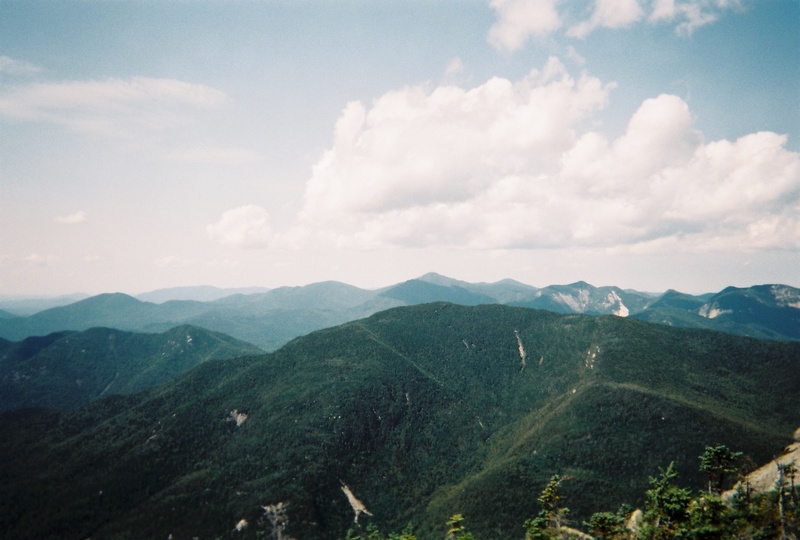 Instead of camping out and hiking from camp, I rose early (middle of the night, actually) to drive to the Adirondack High Peaks and begin the 14-15 hour round trip hike near dawn, then driving home, arriving in the middle of the next night. It was a long day, but doable, and I wanted to climb Marcy again. I picked a glorious day, consumed a great deal of coffee, and took the photos from Marcy that appear in this October “A Wilderness Hike” series. At the top, I enjoyed a long talk with the Summit Steward. I mentioned Dix and my reservations, but she said, “No, you want to climb Dix from the other side, starting at Elk Lake, up through Hunter’s Pass.” She showed me the trail on the map. I asked about the time and the distance—about the same as the one for Marcy that day. Hmmm. Perhaps Dix was a possibility after all. And a few weeks later, I was up in the middle of the night, heading for the High Peaks. I was looking forward to it. Dix is different from Marcy. 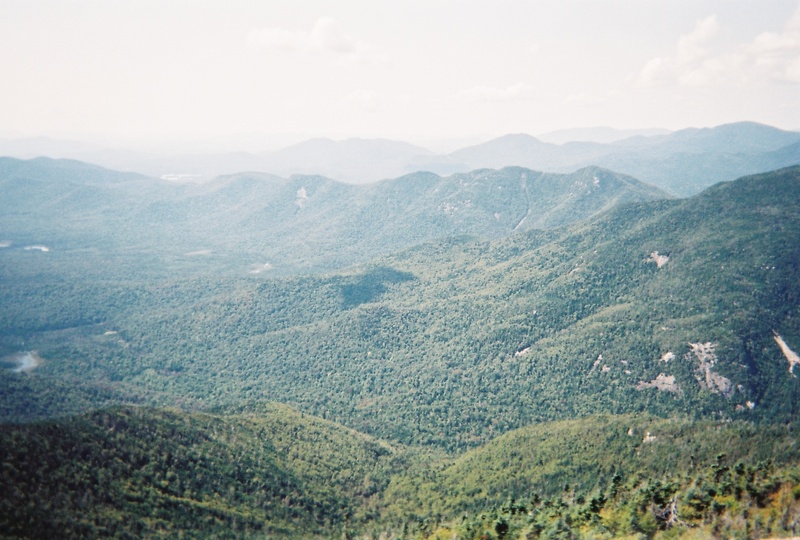 Especially in the summer, hiking Marcy’s trail is like walking New York’s 42nd street—it’s popular climb. Additionally, multiple trails branch off to other peaks. It’s a network of activity. Dix, however, is in the center of the Dix Mountain wilderness. There is nothing else. No trails branch off. No lodges nearby house hikers. 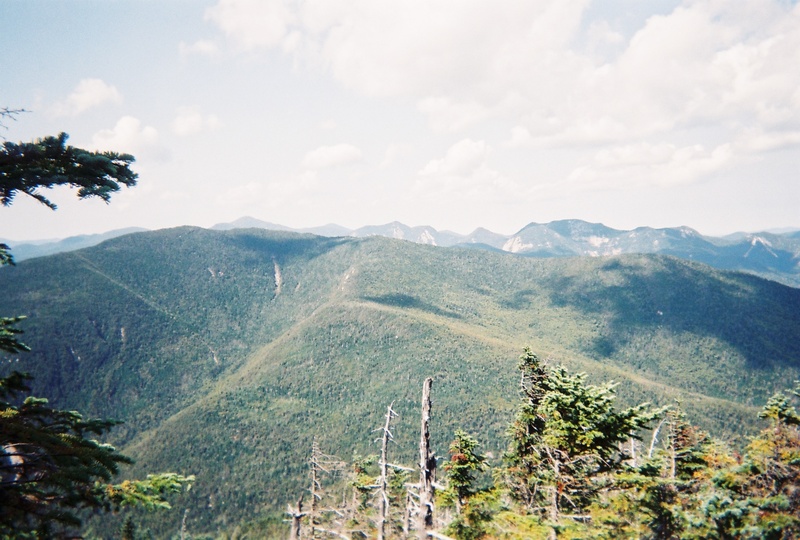 Even the other high peaks around Dix have no trails—literally, no trails; “46ers” looking to climb each of the 46 high peaks typically go “peak bagging” to climb the five in the Dix Wilderness—basically, scramble through to each one. Wilderness. Definitely not heavily travelled. I passed one camp in a lean-to, and saw one other guy on the summit. Right from the start, this was a different hike. First, there was no place to sign in. Oops. This was private land, not policed by the DEC rangers. People knew I went hiking, but they wouldn’t know where. And I was alone—with just my dog. Next, although this had been a dry summer, with yellow leaved trees at higher elevations, this trail was wet. Very wet. And rocky. Slippery and rocky. The entire way. And although the day would hit 90 degrees Fahrenheit, I wore my jacket most of the way; the trail was in the shadow of the mountain ridges, which again prevented the moisture from drying up. Essentially, the trail paralleled a stream, climbing steadily. I was struck by the extreme feeling of wilderness. I was in the middle of nothing, from a civilization perspective. And nature—just didn’t care. I was insignificant, another insect or raccoon or bear or whatever moving through probably the wildest spot I’d ever hiked. This would be a place to go to disappear and die. It was . . . sobering. The trail continued, steadily up, now along the side of a mountain. Wilder and wilder. And then—across a ravine . . . and up. I mean—up. Straight up. Suddenly I’m climbing over boulders, stepping over gaps twenty feet down. If I slipped here, injured, I’d lay there and die rather than be found. But these were crossed, quite a workout, safely. Even my dog managed fine. And then—the trail continued . . . straight up. Literally. Pulling up the rock faces up the side of the mountain. Even used to hiking all summer, it was hard, tiring work. I’ve never seen a “trail” like it. A couple of times, my dog lay down and almost refused to continue—despite also being energetic and used to climbing and hiking. We were in a hard spot now. The day was getting late, and I worried about getting to the summit in time to get back down before dark—I did not want to be stuck in this wilderness in the dark. Continuing was difficult going. Descending was going to be equally difficult. The next few hours, I would wonder whether I should continue or abort. Unlike my other hikes this summer, I knew nothing about where I was, and there was no one to ask. I was getting a little scared. No mistakes. No mistakes today. I could not afford them. I was expecting a fork in the trail where two ways up split. But, somewhere I must have passed that already, because when I finally did find a fork, despairing over what seemed another hour or more to the summit, it turned out to be a junction with a trail from the other side of the mountain; the fork I thought it was must have been passed noticed. Twenty minutes later, I was on a ridge that turned out to be the summit. I was there—and very relieved. And very, very, tired. So was my dog; she stretched out, lay down on the rock, then over on her side, and slept most of the 90 minutes I spent at the top. But now there—after leaving a cell phone message (coverage was possible at the summit, though not on the trail) with a friend explaining where I was, just in case, I settled down for lunch and the glorious, incredible views from every side. It’s the most remarkable climb I’ve ever had. Just beautiful. Amazingly beautiful. The mountains there are “in your face,” and continue peak after peak after peak. If you can, climb this mountain. It’s stunning. Absolutely stunning. After the scary climb up, hiking out the lower part after dark seemed not such a challenge (and I did have a flashlight). This time, I knew the trail a little. So I stayed at the summit as long as I could/dared, packed up, and started down. Descending the rock faces was no fun. Nor did my dog see the wisdom of pushing on, when clearly a better plan was lounging in the plush moss. But we got down safely. Oh there were problems. My belt broke. A pack strap ripped (I used my belt pieces to fashion a makeshift repair). My shoes were soaked, and taking their toll on my feet, even with merino wool socks. But, three hours after sunset, finally we were back at the car. Safe. Drove a little, slept a little, drove a little more, got home a little before sunrise, and slept like stone. With glorious photos, and a memory for a lifetime. Shanti, just arrived at the summit, a few seconds before lying on her side for a well-earned hour’s nap. And a very tired husky.